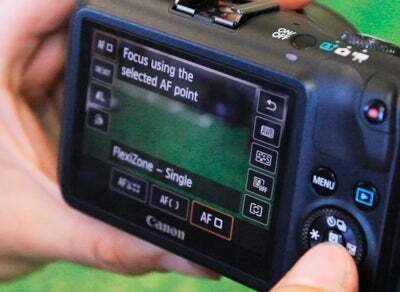 Following the announcement of the EOS M – Canon’s first compact system camera, What Digital Camera were invited along to Canon’s headquarters to try out and lay hands on a selection of four pre production samples. Here we offer our initial thoughts after spending a couple of hours using and handling the camera. 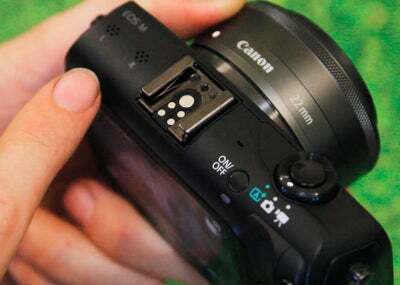 On arrival, our first impressions of the EOS M were all about its size. The camera appears small and diminutive in comparison with the EOS 650D – Canon’s latest DSLR from which the EOS M shares many features. Lined up alongside the EOS 650D it reveals Canon’s achievement of squeezing the technology from a bulkier model within a camera that’s much leaner in every dimension. Shortly after picking up the camera the first thing that struck us was the quality of the build. Despite being one of the smaller CSC’s in the hand it has a strong feel with similar aesthetics at the rear to Canon’s PowerShot compact models. Aimed at the type of user who’s previously been put off by a DSLR but is looking for something slightly more advanced than a compact, the EOS M is clearly made to be as simple as possible. This point is backed up by the very basic arrangement of buttons at the rear and on the top plate. 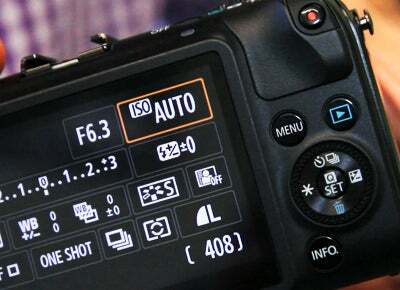 The switch around the shutter is used to control the cameras shooting mode, whether it be Auto, Manual or video mode. As a switch it notches into place satisfyingly and as one might expect you do need to have it in Movie mode to record HD video. You can’t simply press the red record button to instantly commence recording after taking a still image. Taking off the 22mm EF-M prime lens revealed two interesting points. First is the colour of the lens. Rather than being plain black both the 22mm f/2 STM and the 18-55mm f/3.5-5.6 IS STM lens are a dark grey granite shade. They look right at home connected to the silver EOS M, which we decided was our favourite colour of the four. The size of the lenses are the clear giveaway that they’re designed for the EOS M, however the colour reinforces the idea that Canon want to distinguish the EF-M mount from EF-S and EF lens mounts so as not to confuse its users and make them easily recognisable. The second interesting point is just how close the sensor lies to the lens mount – 18mm to be precise. To put this in perspective there’s a 44mm gap between the flange and the sensor on a typical Canon DSLR. 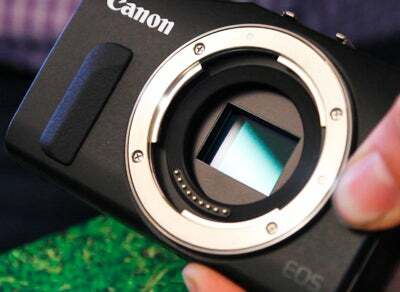 This means the sensor is more exposed to dust reaching the sensor as lenses are changed on the EOS M. Canon say they’ve addressed this point by making sure the EOS M features a integrated cleaning system. The 3in, 1040k-dot touchscreen at the rear is incredibly sharp and offered fantastic control in the short time that we used it. Accessing menu functions is incredibly straightforward and because the screen is so responsive to touch we didn’t have to double tap the screen once. The screen was a pleasure to use when navigating around the menu and we particularly like the way you can access shutter speed and aperture values before adjusting them by simply swiping your finger gently across the screen. Furthermore, the touch screen was incredibly intuitive when we wanted to zoom into an image. Expanding your fingers on the screen’s surface instantly took us in close enough to assess image sharpness and if you do the opposite (move two fingers together on the screen surface) you’ll be able to view thumbnails of the shots you’ve taken, which could speed up the time it takes to find an image if you’ve taken a card full. At present those who choose to go for the EOS M with the 22mm f/2 STM lens have no choice but to buy it with the EF-EOS M mount adapter, which seems slightly odd given that not all consumers may necessarily have Canon EF and EF-S lenses to use. Unlike the lenses, the mount adapter is black and quite big in terms of its size. 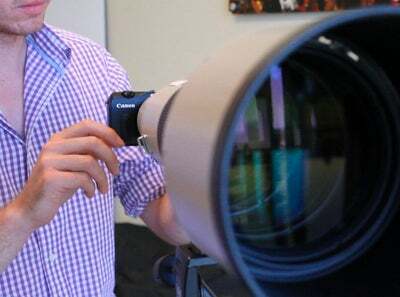 As a bit of fun Canon had kindly set up an 800mm f/5.6 L IS USM lens for us to try with the EOS M. What struck us was the EOS M’s ability to quickly lock focus with what is one of Canon’s most expensive lenses ever produced. It’s a combination that will probably never be seen together again but it did go to show how that the EOS M works with EF lenses. If you include all the EF and EF-S lenses Canon produce, 72 lenses in total support the EOS M.
So on overview our initial impressions were very good. Some may feel underwhelmed by the design of the EOS M, especially those who thought it was going to follow the look and style of Canon’s G-series. We have to say it’s a design that’s growing on us and we’re looking forward to the full review samples arriving in late September or early October to carry out our full testing and review.